Unlike SEO, social media, or paid advertising, email is one of the few remaining digital channels your clients own. 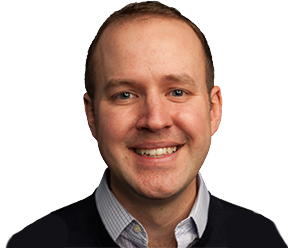 And it continues to be one of the most effective–consistently reported to have a near-or-above 40:1 ROI. But there’s a big gap between the potential of email and the time and expertise it takes to be successful with it. Half of small businesses owners aren’t yet sending a newsletter. And for the ones who are, newsletters take way too long to create. Which makes newsletters a fantastic service offering for small agencies–especially if you’re already doing content marketing or social media management on behalf of your clients. The Tidings Agency Platform gives you a turnkey extension of your existing efforts into email, at a low cost (just $7/mo/client). And most importantly, it helps your clients reach even more customers and prospects, and helps build word-of-mouth referrals. Email’s only going to become more important with the ongoing changes at Google and Facebook. Google and Facebook are making it harder than ever for local businesses to get organic visibility. That’s not just a problem for the businesses themselves, but the agencies who are trying to help them. Many of you probably know, I’ve spent my career helping local businesses get better rankings on Google. My previous company, GetListed.org, helped over 2 million businesses claim and enhance their local search listings, and its successor, Moz Local, has helped many, many more. I’m a big believer in local search and I’m still closely connected to it via my bi-weekly Minutive and Agency Insider newsletters. But increasingly, the forces within Google and outside of it are making SEO far less effective for local businesses–and less cost-effective–than it used to be. In addition to increased competition from national brands and other local businesses (everyone seems to have finally caught the Local SEO bug! ), the combination of more ads, an increase in Knowledge Panels, and the transition to voice search are combining to produce fewer winners among local businesses. Google’s increased monetization of the Local SERP is one of the reasons I recommended way back in 2016 that all agencies serving local businesses begin to develop a core competency in cheap, quickly-deployable Adwords campaigns. But since then, we’ve seen massive improvements in Google’s Adwords Express program and the release of Local Service Ads. The writing is on the wall: Google is automating its ad products, increasingly selling them directly to small businesses. And even on the paid side, many agencies will soon feel the squeeze, if they’re not already. Think about Local Service Ads in particular (like the one below). Google chooses the keywords. There’s no creative to build. It’s a fixed cost per lead, so there’s no bid management. There’s not even a landing page to design, develop, and optimize. And these ads, and others like them, will roll out across many, many more categories and all geographies, at least in the United States, in the coming years. What will happen to these agencies who have made organic SEO–now yielding fewer customers–and Adwords–where they’re now unable to add any value above and beyond what Google provides directly–their bread-and-butter service offerings? 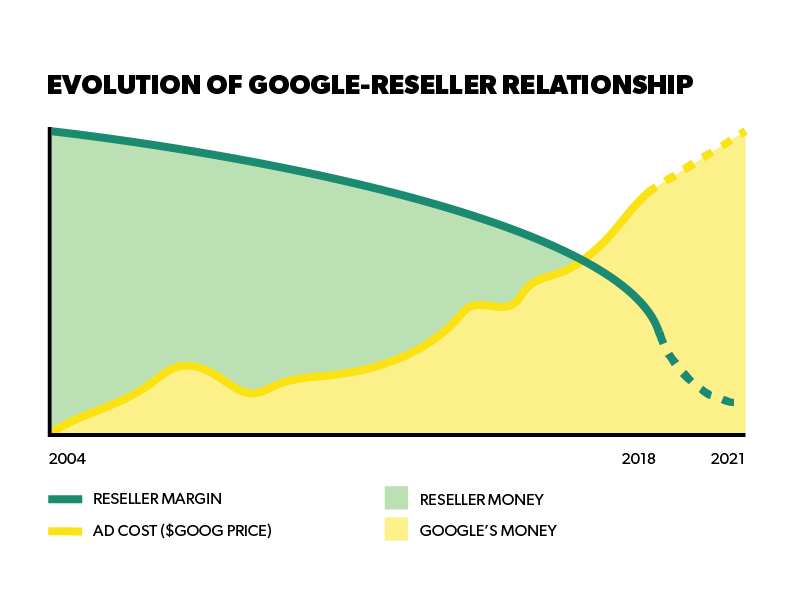 We’ve already seen Google put the Yellow Pages and print industries on life support, and unfortunately a rising Google tide no longer means a rise for small agency boats. They’re disintermediating you from your customers, regardless of how many clients you manage or how many certifications you earn. You can (and probably should) offer social media as a core service offering. For one thing, it’s the most in-demand service among small businesses according to numerous studies from GetResponse, InfusionSoft, the Local Search Association, and others. And frankly, it works. Facebook and Instagram are terrific places to engage existing customers and provide new prospects with social proof and confidence in a business. But with each algorithmic update, Facebook becomes more and more pay-to-play. And Instagram is sure to follow–especially as Facebook’s own user growth plateaus and its News Feed becomes saturated with ads. As Google and Facebook continue to monetize more heavily, email will continue to be an effective channel as far into the future as I can see. 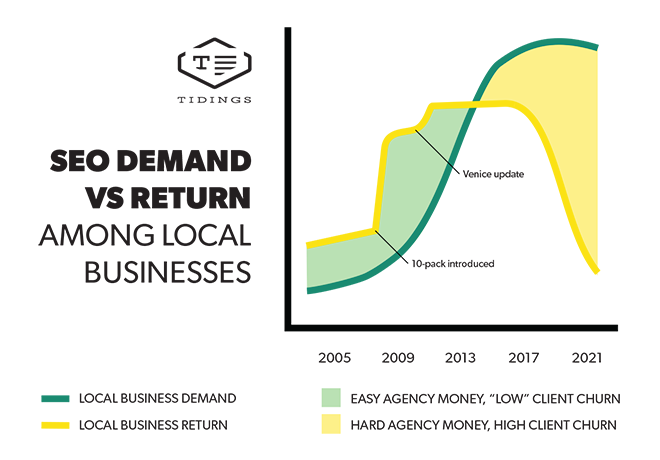 I hope you’ll consider the Tidings Agency Platform to help your clients realize its potential. Any questions I can answer about our Agency Platform? Please let me know using the form below!